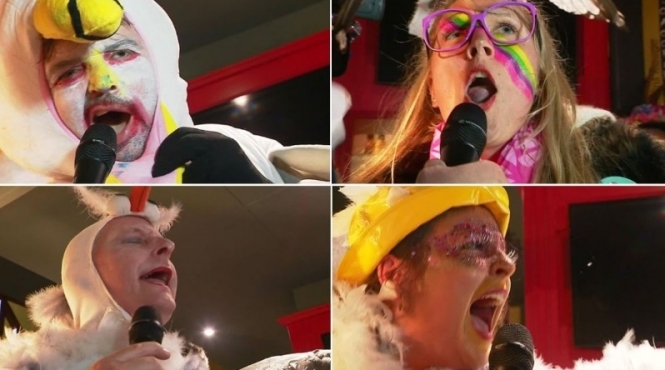 The distinctive and “crazy” competition asks local festival attendees to take part by imitating the sound of a sharp seagull’s cry into a microphone, in front of gathered crowds. A small team of judges notes comments and marks on clipboards before judging the overall winner. Participants usually dress up in eccentric festival costumes, and embrace the raucous atmosphere of the carnival. The winner is rewarded with a real glass trophy, plus bragging rights and the knowledge that their seagull cry is the most realistic in the room. Anyone - men, women, old, young - is allowed to enter. Participants say - somewhat tongue-in-cheek - that taking part requires practice and training, especially “at home to disturb the neighbours”. This year, the winner was a Lille (Nord, Hauts-de-France) woman named Justine. The competition is not the only one in France to ask participants to imitate the cry of an animal; one contest in the commune of Trie-sur-Baïse (Hautes-Pyrénées, Occitanie) judges competitors on none other than their best pig oink. The Dunkirk carnival will continue until March 23, and includes a wide variety of events, parades, displays and shows throughout the city. Apart from the seagull’s cry contest, another major event at the carnival is the “release of the herrings”, which draws huge crowds in front of the city’s Hôtel de Ville.